Here we go! Who Dat? It's our time... so get your beaded umbrellas, crunk cups, flamboyant costumes, white rags, NOLA swag, and hold on baby! Who Dat? Super Bowl Shuffle has added Free Hurricanes to the menu to compliment the Free Beer, Jambalaya and Mardi Gras Beads. We plan to second line the streets of East Austin once NOLA brings home the prize! 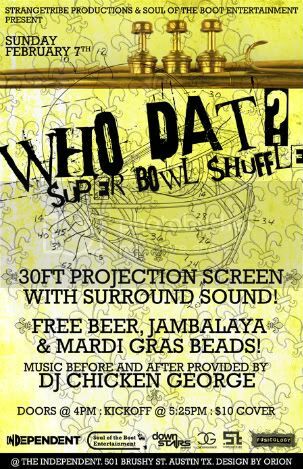 DJ Chicken George will provide the grooves as we watch NOLA in HD on a 30ft projection screen! 21+ 10 beans! Flyest NOLA get down in all of Austin. Come feel it!